Muffins are baked products made in two different ways: part-raised flatbread and cupcake-like quickbread. Flatbread muffins’ history began in Europe during the 18th century, while quickbread started in North America during the 19th century. Nowadays, muffins are loved by many consumers worldwide. They’re easy to bake as they only require a few ingredients, making them an ideal subject for baking lessons. In order to create a perfectly shaped muffin, the muffin pan is smeared with butter or a few drops of cooking oil for minimal sticking. That said, having the best muffin pans can help you create professionally inspired muffins that would truly entice customers to eat. We have provided some tips to help you choose the best muffin pan for your needs along with a list of products that can help you create the best looking and tasting muffins. In order to come up with a presentable-looking and edible muffin, it should be evenly baked on all sides – no burnt or undercooked edges. Also, it should not be asymmetrically shaped so as to make it attractive. The muffin pan plays a great factor in creating the best muffin. Despite using the right ingredients in precise amounts, the said pan can still affect the overall product. Therefore, you should take into consideration the following standards in buying your own muffin pan. A thicker pan often has a prolonged lifespan in contrast to a lighter and thinner pan, as the latter is prone to warping over time. Therefore, investing in thicker ones is more ideal since they are more durable and trustworthy. Aluminum and silicone-based pans are capable of providing equal heat distribution which eradicates the common problem of burnt edges and gooey insides of a muffin. As a result, you won’t have to throw away your overcooked or undercooked muffins. The muffin batter tends to stick on the pan once exposed to heat. Using an ordinary pan tends to create messy and unequally shaped muffins, making it less presentable. On the other hand, nonstick pans give you a much better and fun baking experience as removing the baked product out of the well is not as tedious as it sounds on ordinary pans. In addition, cleaning won’t be much of a problem as well since crumbs can easily glide off the surface merely with the use of water. If you opt to buy nonstick muffin pans, make sure it’s light. Dark colored products absorb more light which promotes browning on the sides of your muffin. Too much browning on the muffin tends to create unevenness on the overall appearance of your baked product, making them look less appealing to look at. This 12-cup muffin pan from OXO Good Grips helps you create a flawlessly beautiful and professionally made muffin with its nonstick properties. As this pan is made of aluminum, it helps in the even distribution of heat in your muffin batter and has an easy release. Furthermore, it’s built of the best quality materials for it to be useful in the years to come. This aluminum-based steel contains ceramic and PFOA-free coating which makes it safe to use, durable, and easy to remove. While steel is prone to scratches, staining, and corrosion, this product is resistant to the said permanent damages. Made of 12 wells for easy batch baking, this product from Nordic ware is purely made of aluminum. Aluminum helps in equal distribution of the heat, resulting in evenly baked muffins. Additionally, the pan also contains encapsulated steel rim for the prevention of warping, making it usable for a long period of time. Its overall design is easy to clean; therefore, areas with fragments from the baked product can easily be cleaned through hand washing. This pan that is capable of creating dozens of baked goods is an american product that is carefully designed for bakers who are looking for even baking and browning, pans with nonstick properties, and perfectly shaped muffins. Goldtouch nonstick coating also serves as protection against scratches. The pan is designed with extended edges for easy grasping in and out of the oven. USA Pan is a family-owned business based in the United States. Their baking pan, the Crown Muffin Pan, is made of aluminum which gives off an even heat distribution on all sides of the batter and is considered as the material of choice for baking. From the name per se, it is intended in making wonderfully crowned muffins similar to those commercially-made muffins with its oversized top. It features Americoat, a silicone coating that promotes nonstick properties and easy release of baked products. Cleaning only requires hand washing. This kitchenware from Rachel Ray also sells muffin pans with 12 wells, each designed with different colorful silicone grips that would surely make your baking experience a positive one. It’s a latte-colored nonstick pan with rolled rim edges makes baking and cleaning easier and hassle-free. Durability-wise, the pan can withstand up to 450 degrees Fahrenheit without deformities even after several uses. Started in 1929, Wilton has brought joy towards bakers who wish to make pastries for everyone to enjoy. Coated with nonstick properties, this 12-well muffin pan is easy and tidy to use. In addition, its handles are easy and comfortable to grasp. Muffins can be easily released from the pan, which makes it convenient for bakers. Furthermore, it is dishwasher-safe. Unlike other baking pans, this product from Anolon is made of thicker metal for more durability and prevention of warping. It has a nonstick coating, perfect for easy and hassle-free baking. Its SureGrip handles make it easy to get the pan in and out the oven. Additionally, it can withstand up to 450 degrees Fahrenheit. Baking sheets are no longer needed upon baking. This chocolate brown nonstick pan from Circulon is made of heavy metal for a sturdier and highly efficient product. It has a rolled rim design and wide handles suitable for handling even with thick mitts. Using this pan does not require intensive cleaning as it can be easily washed with the use of dishwasher; however, handwashing is a much-preferred procedure to avoid scratches and dents. Interestingly, this pan from Keliwa deviates itself from the mundane metal pans sold by most companies. Instead of the plain metallic look, it comes in a bright color and is made of silicone. Albeit made of silicone, it is still coated with nonstick coating and is also easy to clean after use. This pan designed for muffin and cornbread is made of iron instead of the usual aluminum material. It only caters 6 wells, each with a depth of 1.5 inches. Cast iron also produces great heat regulation, allowing baked products to be cooked perfectly and with the impeccable crust after the process. It is easy to clean with hand washing. Established in 1963 in Toledo, Ohio, Calphalon has provided excellent muffin pans for bakers who wish to bake their favorite pastry. Compared to the traditional Calphalon nonstick pan, this product is 4 times longer lasting. It is made of ceramic material, intended for nonstick properties and easy release. In addition, ceramic is also less prone to scratches, making the pan looking brand new even after several uses. The pan can withstand temperatures of up to 500 degrees Fahrenheit. Cleaning after use only requires hand washing. 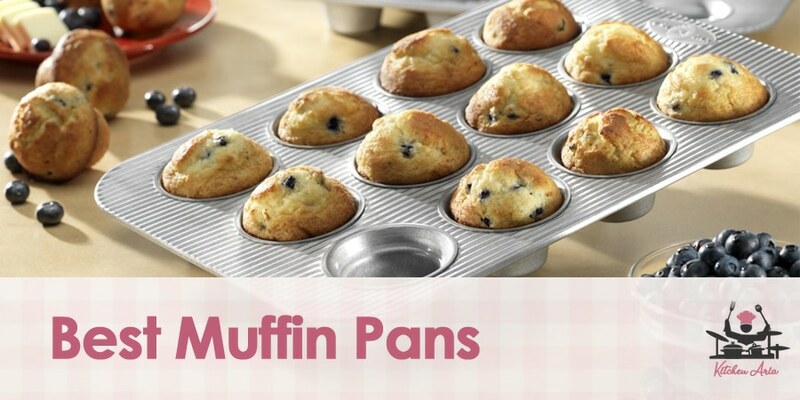 This 2-set baking pan from AmazonBasics helps create delicious muffins. Made of carbon steel, it gives an assurance of durability and quick, even heating of muffins for equal and proper browning. Heating the pan up to 500 degrees Fahrenheit does not damage or deform it. Its nonstick properties encourage bakers to use this pan as freshly baked products can easily be released from the well. Hand washing is highly recommended to avoid scratching the pan and damaging its coat. Although making muffin is easy, you should use the right baking pan to ensure that you will successfully achieve an evenly baked, well-shaped muffin. Nonstick material is highly recommended, not only for muffins pans but also for cake pans and other baking pans as well for easy removal of the finished baked masterpieces.